Port Dolphin LNG offshore import was approved by MARAD, the U.S. Coast Guard’s Maritime Administration’s Deepwater Port Licensing. 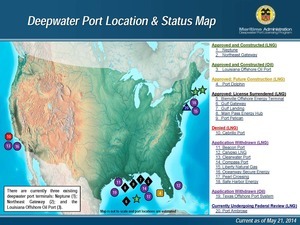 Port Dolphin is still listed by MARAD as “Approved” and “Future Construction”, although it also got a FERC certificate in 2009 for interconnecting with Gulfstream and Florida Gas Transmission (FGT), the two existing “natural” gas pipelines into Florida, under docket nos. CP07-191-000, CP07-191-001, CP07-192-000. 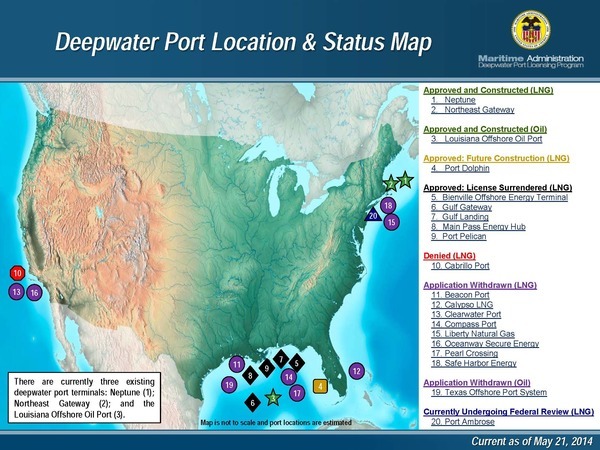 FERC order of 23 October 2015 vacated that permit for Port Dolphin. MARAD lists an LNG export project off the Florida Atlantic coast called Calypso LNG as “Withdrawn/Cancelled”. That project is also listed by “A Barrel Full of information for oil industry professionals” as “Cancelled”. But that GDF-Suez project proposed for 8-10 miles offshore from Port Everglades, FL bears watching in case it gets revived, esp. since Port Everglades was mentioned way back in October 2013 as one of the three FPL “clean energy” plants associated with the proposed Sabal Trail pipeline. Port Everglades was also the proposed start point for the AES Ocean Express pipeline from Florida to Bahamas, which appears to have only been stymied by the government of the Bahamas refusing to play along. If Bahamas did approve, that undersea pipeline would end up outside U.S. jurisdiction, and could export LNG anywhere in the world. And let’s not forget the Florida press (and The Rachel Maddow Show) have linked Florida Governor Rick Scott, who owned stock in Spectra Energy at the time, to both Port Everglades and Sabal Trail. Elba Island LNG export in Georgia is going through the FERC process, while Cove Point LNG export in Maryland was already approved by FERC, which is one reason for the greatly increased protests at FERC HQ in DC. Jordan Cove and Oregon LNG export in Oregon, fed by a Williams Company pipeline, in turn fed by a Spectra pipeline in Canada, I think is in FERC process. In Canada, it’s National Energy Board (NEB), which has approved LNG export from British Columbia including competing natural gas pipelines by Spectra and TransCanada (of Keystone XL fame). NEB is also the permitting body for LNG export proposals in Nova Scotia, which would be fed by the Maritimes & Northeast Pipeline, which, you guessed it, is a Spectra pipeline. FERC is widely considered to be a rubberstamp for fossil fuel projects, given that apparently it has only ever denied two pipelines, and FERC brags to Congress every year about 100% cost recovery through charges and fees from the very industries it supposedly “regulates”: a textbook case of regulatory capture. All of the Florida LNG export operations were approved by the Office of Fossil Energy (FE) of the U.S. Department of Energy (DoE), although the Federal Energy Regulatory Commission (FERC) was also involved in some of them. The large amount of natural gas in the U.S. is also creating an impetus for something that was nearly unimaginable ten or fifteen years ago, LNG export, as opposed to import terminals. And how would someone successfully rebut it in the 30 days FE has to decide on a permit? It’s a shell game. Can’t get your LNG export through FERC fast enough? Try FE! That’s what Strom did. FERC kicked them out for lack of fee payment, so they went to FE. Can’t get your north central Florida Starke location approved? Shift to Citrus County, where you can still get your fracked methane fix from Sabal Trail! That’s what Strom is doing. Can’t get your U.S. LNG export approval fast enough? Ship your fracked gas by pipeline to Canada for export from Nova Scotia! TRAVIS BUBENIK, BYLINE: The Big Bend region in far West Texas is a place where some cattle ranchers have been in the same family for generations. In this windy and mountainous high desert corner of the state, there aren’t any oil rigs, no gas wells, no coal and no big pipelines. But a Dallas company wants to build a 143-mile natural gas underground pipeline here, not to bring gas to Texans, but to Mexico. That doesn’t sit well with some people. JOEL NELSON: They are simply wanting to get their gas into Mexico. BUBENIK: At a community meeting about the pipeline, rancher Joel Nelson says he doesn’t care what the pros or cons are, he just plain doesn’t want it here. The Big Bend of the Rio Grande, a place even less populated than Suwannee County, Florida, which the U.S. Pipeline & Hazardous Materials Safety Agency (PHMSA) apparently considers almost completely unpopulated, and thus undeserving of thicker pipe or some other safety measures. Water is a big local issue in both places: at the Rio Grande because there’s so little of it, and at the Suwannee River because the Floridan Aquifer is the only source of it. But let’s not forget Spectra also rammed a pipeline through New Jersey under the Hudson River into Manhattan, despite thousands of ecomments in opposition, many meetings packed full with opponents, and several lawsuits. If you’re a pipeline company, you don’t even have to apply for export; just get your “competitor” Kinder Morgan to apply for a connecting Jacksonville Expansion Project (JEP) to JAXport, which just happens to be gearing up for LNG export. All this while the sun is rising. Solar power is now growing so fast even FPL’s parent NextEra Energy is investing in it while selling off fossil fuel projects, some of them to (sucker!) FPL. Local people apparently don’t matter to pipeline profits for companies from Houston. It’s time for the people to stop fracking, pipelines, and LNG export. You can call your elected and appointed officials today and ask them to stop this shell game for fossil fuel profits at all our expense.